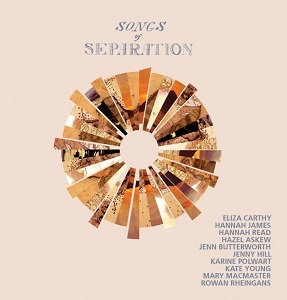 "Songs of separation" is a collaboration by ten female contempary folk artists - Eliza Carthy, Hannah James, Hannah Read, Hazel Askew, Jenn Butterworth, Jenny Hill, Karine Polwart, Kate Young, Mary Macmaser and Rowan Rheingans. The album was recorded on the Isle of Eigg in the Scottish Inner Hebrides. Ahead of the release of the album in January, a double-A side single has been released featuring "Echo mocks the corncrake (featuring Karine Polwart) and "It was a for our rightfu' king" (featuring Hannah Read). Check out the video for "Echo mocks the corncrake" below. The album is a mix of traditional songs and new ones and is intended to prompt new thinking about the issue of separation as it occurs in our lives. I have to say that I love this album - one listen and I was hooked. All the singers performing on the album have their own individual vocal styles which makes the album quite diverse, and the different songs all have their own sounds too, and as a result while the album is 12 folk songs, al are quite distinct from each other yet never feel like they've been picked out at random - despite the differences they all feel like they belong together. With some songs or albums you're quite content to just let the music wash over you and not pay too much attention to the lyrics, but with this album you find yourself paying close attention to the lyrics (but without ignoring the music), and that is a sign of how well written the album is - the lyrics and music are equally important to the listener. It's a fantastic album and is highly recommended.